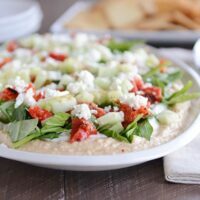 So delicious, this layered Greek hummus dip is the perfect healthy snack or appetizer. 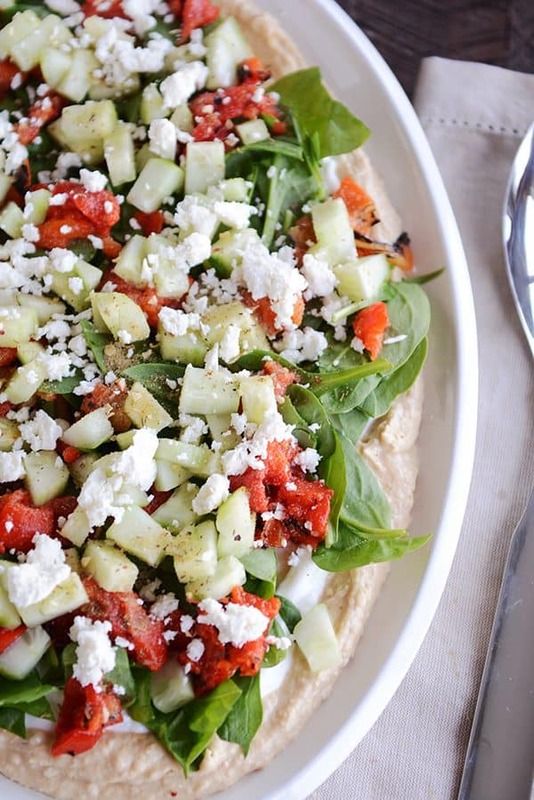 Hummus, yogurt, spinach, feta…all sorts of good things going on here! Guys, I know I already waxed poetic about my love for Greek-style food just a few weeks ago with this stellar Instant Pot tender Greek pork recipe. But continuing on that love train, I can’t help but share one of my new, favorite obsessions: this layered Greek yogurt hummus dip. 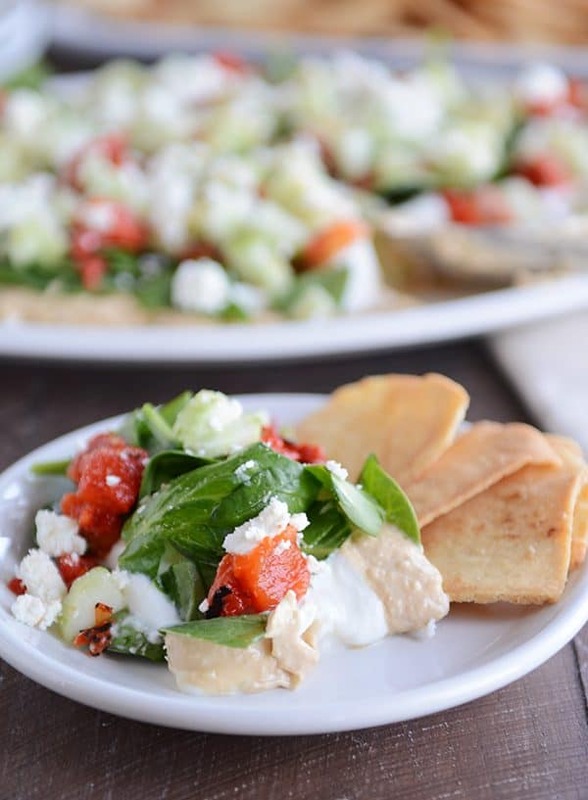 It is crazy delicious…and so easy, you’ll be dipping in pita chips right and left in just minutes. My friend, Mel, sent me a variation of this recipe last year, and I’ve been making it nonstop. My favorite? An individual-sized version for a quick (and super tasty) lunch. A few months ago, I made it for a church party, and it was wildly popular (that’s saying a lot since there was also an epic chocolate fountain at said party). It goes without saying that the variations on this hummus dip are nearly endless. Swap out ingredients you don’t like and add in the ones you do! Cherry tomatoes for (or in addition to) the roasted red peppers, maybe? A smattering of chopped red onion to complement the other flavors? What about black or kalamata olives for a salty punch? 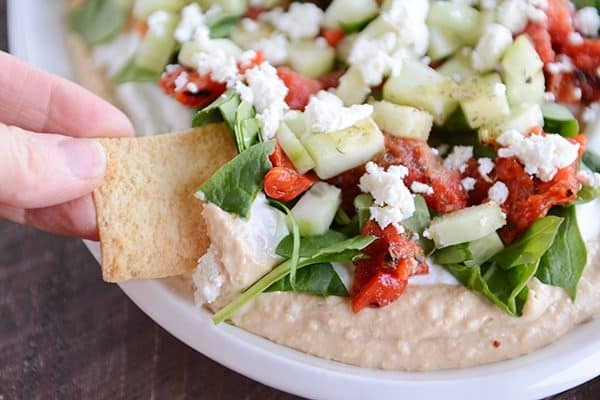 You really can’t go wrong with this easy and healthy hummus dip. It’s perfect for a party appetizer or just for general snacking. If you are anything like me, “general snacking” is a very serious and important part of daily routines. The only misstep will be if you omit the seasoning from the 7-layer lineup. No matter if you opt for Greek seasoning, every day salt and pepper, or go off the grid with an Italian herb seasoning (ahem, that has happened here, and it’s delicious)…this dip is changed in extraordinary ways by that little pop of flavor. A couple other notes, 1) if you haven’t ever bought feta cheese in a block (vs already crumbled), try snagging some for this recipe! I’ve always found it at Trader Joe’s (a 40 minute drive) but miracle upon miracle, I spied it the other day at my smalltown grocery store…and then tried to ignore the awkward stares of other shoppers while I executed a seriously bad cartwheel to celebrate my excitement. Block feta that you crumble yourself is so creamy and soft and delicious. 2) storebought or homemade hummus is going to work great here. A flavored hummus would be fantastic, I’m sure, as well! Roasted red pepper hummus? 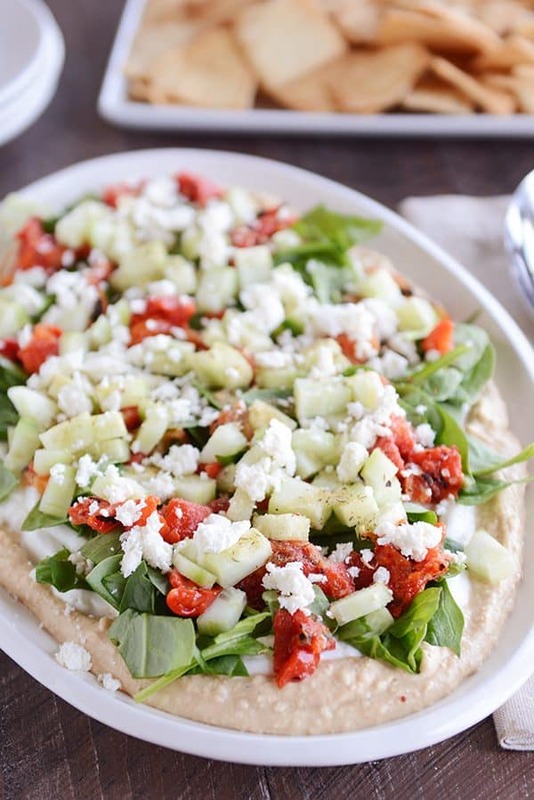 Zucchini hummus? For storebought brands, I’m particularly fond of the roasted garlic hummus at Costco or the beet hummus (ridiculously good) from Trader Joe’s. Spread hummus on a plate or serving platter. Dollop the yogurt across the top and spread into a somewhat even layer (doesn't have to be perfect). Sprinkle seasoning of choice (see note) lightly over the top of the yogurt. Top with chopped spinach, roasted red peppers, cucumbers and feta cheese. Sprinkle additional seasoning over the top, if desired. Serve immediately (can chill for an hour or so before serving but any longer and the yogurt will have a tendency to put off a bit of liquid/whey). 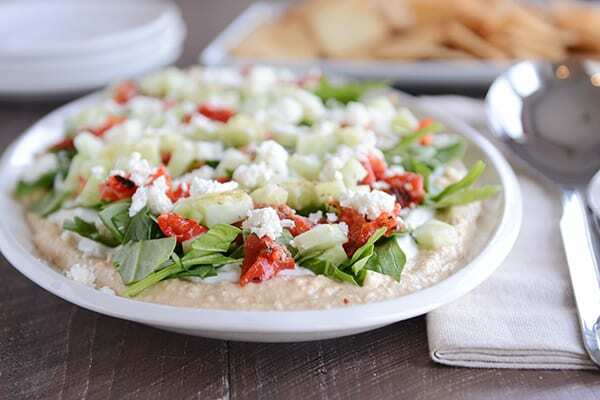 This dip is very versatile - you could easily sub out the roasted red peppers for cherry tomatoes, baby kale instead of spinach, leave off ingredients you don't care for and add ones you love (think: olives, lemon zest, red onion, other veggies). I've made this with homemade hummus, and it's also crazy delicious with the roasted garlic hummus from Costco. I highly recommend using block feta cheese if you can find it (crumble it yourself vs buying it already crumbled); it is so creamy and delicious. This quick appetizer really benefits from a light dusting of seasoning. I've used an Italian herb blend (yeah, yeah, not terribly Greek-ish in flavor, but it was delicious) and on another batch, I did a combo of coarse salt, coarse pepper, and garlic powder. A Greek seasoning would be phenomenal, too. The following info is also on my favorite feta dip post: I keep a simple homemade Greek seasoning in a repurposed spice jar in my pantry. I use this basic recipe on allrecipes.com, omitting the cornstarch, dialing down the cinnamon a bit (probably a heaping 1/2 teaspoon) and I don’t blend it – I just combine in the jar. ﻿I don't recommend making this too far in advance (maybe just a couple of hours); the yogurt will give off liquid/whey as it sits, so I like to make and serve this within a few hours. A lot will depend on the thickness/brand of yogurt. I just made this, in a mini version, for lunch and it was amazing! I’m a sucker for anything with hummus and this did not disappoint! I used homemade hummus and used Greek seasoning for the spices. Thank for an easy and healthy lunch option. Made this for the Super Bowl, and added the pesto to the yogurt like a commenter said. I used roasted peppers, chopped tomatoes, kalamata olives, and all the other stuff. It was so good!! I actually used some Ritz chips that I had a bag of, and it was so yummy!! Oh and I used homemade hummus and homemade plain yogurt (made in the Instant Pot with your recipe!!) and it was so good!! Yum!!! This is a easy lunch to throw together (just used way smaller amounts of everything) and is delicious! I haven’t made my own hummus (yet) but loved it with the stuff I grabbed at the store. I did lemon pepper, garlic powder, oregano and whatever else I felt like throwing in with cherry tomatoes instead of roasted red peppers (didn’t have them) and loved it! Soooo good! I made a lunch size portion of this today and it is delectable. Homemade hummus from a recipe my brother gave me that calls for harissa, so it is slightly spicy and so good. I used course ground pepper, garlic powder, and lemon pepper on top of the Greek yogurt. Highly recommend lemon pepper! It complements everything nicely. Topped it with chopped baby spinach, golden cherry tomatoes, black olives, cucumber, and pre-crumbled feta because that’s all I had. I also found a new product this past week— Rold Gold pretzel thin crisps in a garlic Parmesan flavor. WOW. A perfect combo, indeed. Loved this recipe, it was a fun easy dinner for my husband and I. I made the hummus you provided a link to! Wow, this hummus dip sounds so delicious! I can’t wait to try it myself. Thanks for posting! This was delicious! Having it for lunch all week. Sounds like me, Natalie! 🙂 Glad you loved it. Do you use canned roasted red peppers? I use the ones that come in a jar. Oh Mel this looks divine…Will be taking it to a super bowl party I think! I had to giggle when I read “what brand of yogurt you use” don’t we all make our own yogurt now…thanks to your lovely instructions! Haha…well that would definitely be awesome! But I have to admit, I haven’t made yogurt in a long time (but am recommitted!). Mel, this looks fabulous, will be making it ASAP, I just happen to have chickpeas in the freezer and I am growing a perennial spinach and cherry tomatoes at the mo, so it’s as good as done. I buy the Danish feta from Aldi, I like it better than the Greek variety, it’s super creamy and crumbly at the same time, just love it. Thanks for another great recipe, have a lovely day. I’ve been making this for years inspired by a recipe from Annie’s Eats. I recommend mixing a couple tablespoons of pesto with the Greek yogurt. It is amazing. And some chopped peppercinis. This is probably my most requested party dish. So good! Adding pesto!? Yes, please! Thanks for the suggestion.